Plant Cell Organelles contains the proceedings of the Phytochemical Group Symposium held in London on April 10-12, 1967. Contributors explore most of the ideas concerning the structure, biochemistry, and function of the nuclei, chloroplasts, mitochondria, vacuoles, and other organelles of plant cells. 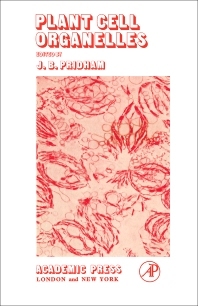 This book is organized into 13 chapters and begins with an overview of the enzymology of plant cell organelles and the localization of enzymes using cytochemical techniques. The text then discusses the structure of the nuclear envelope, chromosomes, and nucleolus, along with chromosome sequestration and replication. The next chapters focus on the structure and function of the mitochondria of higher plant cells, biogenesis in yeast, carbon pathways, and energy transfer function. The book also considers the chloroplast, the endoplasmic reticulum, the Golgi bodies, and the microtubules. The final chapters discuss protein synthesis in cell organelles; polysomes in plant tissues; and lysosomes and spherosomes in plant cells. This book is a valuable source of information for postgraduate workers, although much of the material could be used in undergraduate courses.